..tomorrow, 20th January. Wish me luck! I shall be following the Machame route, taking 6 days with an option on 7. The weather is described as unseasonal, in that they are experiencing rain and snow in what is usually a dry time of year. Still, I've been to Nepal in the monsoon ("definitely finished" says Raju), so nothing can faze me! I'm looking forward to it. I will currently be travelling "alone" in so far as that is permitted, i.e. with a guide, a cook and two porters. Ah well, if you can't make friends, you can always buy them. Kilimanjaro with its three volcanic cones, Kibo, Mawensi, and Shira, is an inactive stratovolcano in north-eastern Tanzania. 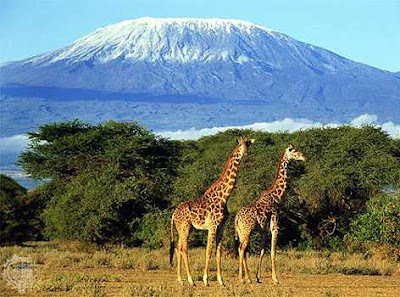 Although it does not have the highest elevation, Kilimanjaro is the tallest free-standing mountain rise in the world, rising 4,600 m (15,100 ft) from its base, and includes the highest peak in Africa at 5,895 meters (19,340 ft), providing a dramatic view from the surrounding plains. 5000m climb with no bars along the way. This one's going to be tough! Full report in a week or thereabouts.